Within a training program on United Nations Human Rights Mechanism between 17-23 June 2018, a fact sheet prepared on the situation of Turkish lawyers. The fact sheet entitled “Challenges to the Independence of the Legal Profession under the State of Emergency in Turkey” was prepared by a delegation of six Turkish lawyers including four The Arrested Lawyers Initiative members, the International Bar Association’s Human Rights Institute, and The Law Society of England and Wales. The fact sheet was then submitted Diego García-Sayán, Special Rapporteur on the Independence of Judges and Lawyers at UN 38th Human Rights Council in Geneve. In 2014, several amendments to the Law on Supreme Board of Judges and Prosecutors were introduced and thus adopted, giving unprecedented control to the government over the judiciary and prosecution services and curtailing the independence of the judiciary. In July 2016, following an attempted coup, Turkey declared a state of emergency that has since been extended seven times. Under these emergency measures, Turkey has suspended provisions of international and regional human rights treaties and has declared 31 decrees that curtail fundamental rights and guarantees. The government used its new powers over the judiciary to harass and persecute legal professionals. The decrees are being used, not only to suppress dissenting voices, but also to restrict and criminalise legal advocacy. The Turkish Constitutional Court ruled that it does not have jurisdiction over the decrees and has recognised that the decrees are exempted from judicial review. Thousands of judges and prosecutors have been arrested, dismissed and arbitrarily transferred to other court. Consequently, access to justice has been severely constrained and the rule of law eroded. To date, more than 1500 lawyers have been prosecuted, 500 arrested and 144 sentenced to lengthy imprisonment. As summarised by the EU Parliament, recent years have seen the extension of executive control over the judiciary and prosecution, the widespread arrest, dismissal and arbitrary transfer of judges and prosecutors, and persistent attacks against lawyers. Since the state of emergency was declared, Parliament has adopted all the emergency decrees thus permanently amending criminal laws. Further, as required by international law, Turkey has failed to demonstrate that the life of the nation was under threat. Beyond the lack of threat, as per Article 4 of the ICCPR, Turkey has also far exceeded the limit that allows states to derogate from their human rights obligations. Since 22 July 2016, Decree No. 668, codified by Law No. 6755, allows a prosecutor to restrict the right of a person in custody to see a lawyer for up to five days, which restricts the right of access to a lawyer within forty-eight hours from the time of arrest or detention guaranteed by Principles 5 and 7 of the UN Basic Principles on the Role of Lawyers. The right to access a lawyer is also protected by Article 14(3)(d) of the ICCPR and Article 6(3)(c) of the ECHR. Under Decree No. 667, codified by Law No. 6749, the amount of time a detainee could be held without charges was extended from four days to 30 days. On 23 January 2017, Decree No. 684, codified by Law No. 7074 finally reduced the maximum period to 14 days from the arrest (excluding the time used to take the suspect to the nearest court). These 14 days are also not complied with on a regular basis, which means that the number of days in detention without charge is further extended. According to Article 19 of the Turkish Constitution, Article 14(3) of the ICCPR and Article 5(2) of the ECHR, the reasons for arrest and charges shall be promptly notified. The Constitution further guarantees that the maximum period for pre-trial detention should be four days. Repeal Laws No. 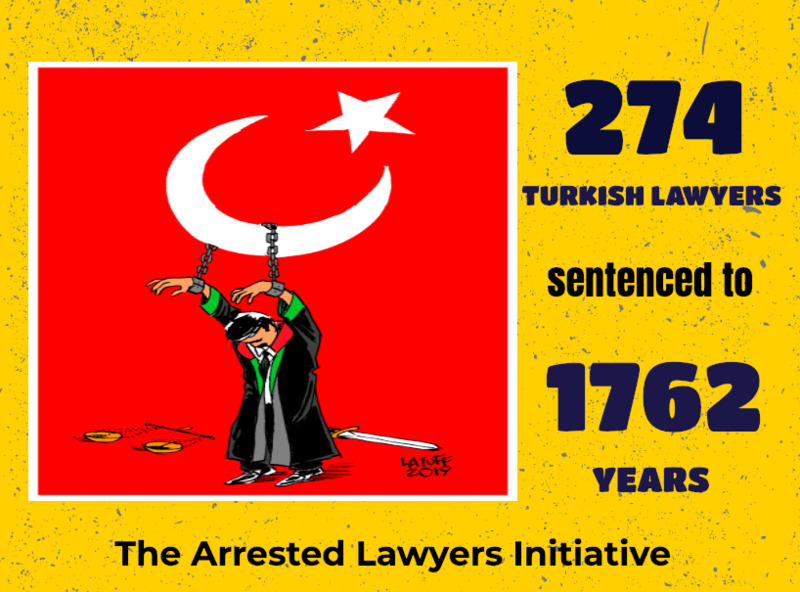 6749 and 7074 and ensure that the maximum period of pre-trial detention never exceeds four days as provided for by the Turkish Constitution and that the reasons for arrest and charges are promptly notified, as guaranteed by the Turkish Constitution, Article 14(3) of the ICCPR and Article 5(2) of the ECHR. Decree No. 667 adopted on 23 July 2016 and codified by Law No. 6749 introduced the possibility for a public prosecutor to request the replacement of a defence lawyer with another lawyer appointed by the Bar Association, under the mere suspicion that the interview between the lawyer and his client could be used for terrorist or criminal activities. Most of the lawyers appointed are junior and inexperienced and, therefore, more likely to be intimidated by public officials. Decree No. 676 adopted on 29 October 2016 and codified by Law No. 7070 amended the Code of Criminal Procedure and incorporated new limitations for convicts to access a lawyer. Prior to Decree No. 676, lawyers could be banned from representing a client only where there was a pending prosecution against them. The new decree extended the limitation to the existence of a pending investigation for forming organised groups with the intention of committing a crime (Article 314 of the Criminal Code) and forming an armed organisation (Article 312 of the Criminal Code). Following the attempted coup, thousands of lawyers representing alleged terrorists, with dissenting opinions, or conducting human rights advocacy have been persecuted, arrested, prosecuted or convicted. In August 2017, the Turkish Ministry of Justice sent an order to all provincial public prosecutors, requesting that lawyers under criminal investigation be banned for two years. To date, in Istanbul alone, more than 400 lawyers have been banned from representing their clients. As mentioned by OHCHR, individuals arrested, including lawyers, have a lot of difficulties finding a lawyer under the state of emergency. The few lawyers still willing to defend suspects of terrorism are too expensive. Legal aid is also insufficient, which means that there is no financial incentive for lawyers to spend adequate time and effort on such work. Such provisions and practice are in violation of the rights of an individual to communicate with counsel of his own choosing and to defend himself through legal assistance of his own choosing guaranteed by Article 14(1), (3)(b) and (d) of the ICCPR, Article 6(3)(c) of the ECHR, as well as Principles 1-3, 6 and 19 of the UN Basic Principles on the Role of Lawyers. Ensure that equal access to a lawyer, sufficient funding for legal services, and an experienced lawyer are guaranteed as provided for by Principles 2, 3 and 6 of the UN Basic Principles on the Role of Lawyers. Decree No. 667, codified by Law No. 6749, further impacted access to justice and the right to a fair trial. The decree allows officials to observe or even record meetings between detainees and their lawyers or take copies of documents exchanged for security reasons. Further, in such cases, the duration and date of the interviews between detainees and their lawyer may be limited upon public prosecutor’s order. Under Decree No. 676, codified by Law No. 7070, this restriction was also extended to consultations in detention. In practice, such measures are automatically adopted in every investigations related to the Gulen movement. Decree No. 668, codified by Law No. 6755, also allow a prosecutor to restrict defence counsels’ right to examine a case-file or make copies if there are any risks regarding the investigation. Prior to the state of emergency, such restrictions could only be ordered by a judge. Decree No. 668 also authorises searches and seizures at lawyers’ offices, without order of a judge or written order by a public prosecutor. These measures are violating Article 14(3)(b) of the ICCPR, Article 6(3)(b) of the ECHR and Principles 8 and 21 of the UN Basic Principles on the Role of Lawyers. Repeal Laws No. 6749 and 6755 and ensure lawyers’ right to communicate and consult with their clients without delay, interception and in full confidentiality, in accordance with Article 14(3)(b) of the ICCPR, Principles 8 and 21 of the UN Basic Principles on the Role of Lawyers, and Article 6(3)(b) of the ECHR. Lawyers representing alleged terrorists, with dissenting opinions or conducting human rights advocacy have been targeted in Turkey and prosecuted for violations of anti-terrorism law and offences against the state (Articles 220, 314 and 302 of the Criminal Code). In practice, a list of lawyers representing political opponents has been prepared by the Justice Ministry’s National Judiciary Informatics System (UYAP) network and sent to prosecution services which then prosecute listed lawyers. As a result, thousands of lawyers have been prosecuted and hundred arrested and convicted. Some lawyers have also been tortured during detention. Such prosecutions or threat thereof strongly affect the independence of lawyers and more particularly the basic guarantees to the functioning of lawyers protected by Principles 16-18, 20, and 23 of the UN Basic Principles on the Role of Lawyers. Ensure the independent and prompt investigation and prosecution of all cases of torture committed by law enforcement officers, in accordance with international law. Turkish Bar Associations are not able to operate as independent professional bodies and to protect the rights of their members. Bar Associations and professional bodies which issue practicing licenses, have been targeted. Presidents and former presidents of 14 provincial bar associations across the country have been prosecuted and imprisoned. Since the state of emergency, provincial bar associations have also refused, without any legal basis, the applications of public agents, such as judges or academics, dismissed from their profession by decrees. This is the case, for example, of Cenk Yiğiter, Yasin Bedir, former Judge Murat Ozkan. Law students prosecuted for alleged terrorist activities are also denied access. These practices are in contradiction with Principles 10, 16 and 24 of the UN Basic Principles on the Role of Lawyers. Guarantee independent judicial review of any decision refusing admission to the bar. The Turkish government has also targeted Turkish lawyers’ freedom of association, in violation with Article 22 of the ICCPR, Article 1 of the ECHR, and Principle 23 of UN Basic Principles on the Role of Lawyers. 34 law societies or associations have been shut down by decrees since the state of emergency. All their assets have also been confiscated without compensation. Chairmen, members of the board and ordinary members of law societies have also been prosecuted and sentenced to long term imprisonment. Immediately end the systematic attack against lawyers’ associations and the prosecution of their members. The Republican People’s Party (CHP) applied to the Constitutional Court for the cancellation of emergency decrees no. 668, 669, 670 and 67. The Constitutional Court rejected their applications respectively with decisions No. 2016/166 E., 2016/159 K., 12.10.2016; No. 2016/167 E., 2016/160 K., 12.10.2016; No. 2016/171 E., 2016/164 K., 02.11.2016; No. 2016/172 E., 2016/165 K., 02.11.2016. European Parliament resolution of 8 February 2018 on the current human rights situation in Turkey (2018/2527(RSP)). Article 3/1 (m), Decree No. 668. Article 6/1-a, Decree No. 667. Article 11, Decree No. 684. Article 6/1 (d), Decree No. 667. OHCHR, Report on the impact of the state of emergency on human rights in Turkey, January-December 2017, March 2018, para. 57. Article 3/1-l, Decree No. 668. OHCHR, Report on the impact of the state of emergency on human rights in Turkey, January-December 2017, March 2018, para. 56. Third party intervention by the Council of Europe Commissioner for Human Rights under Article 36, paragraph 3, of the European Convention on Human Rights, CommDH(2017)29, 10 October 2017. President of Konya Bar Association, Fevzi Kayacan; President of Trabzon Bar Association Orhan Öngöz; President of Siirt Bar Association Cemal Acar; President of Gumushane Bar Association Ismail Tastan; former Presidents of Manisa, Erzurum, Erzincan, Afyon Bar Associations Zeynel Balkiz, Mehmet Güzel, Cemalettin Özer, Mehmet Akalın; presidents of the Aksaray and Kahramanmaras Bar Associations, Levent Bozkurt and Vahit Bagci; and former presidents of Yozgat Bar Association Haci Ibis and FahriAcikgoz. Decrees Nos. 667, 677, 679, 689, 694, codified by Laws No. 6749, 7083, 7084, 7088, and 7078. Çağdaş Hukukçular Derneği, Konya Denge Hukukçular Derneği, Manisa Hukukçular Derneği, Samsun Güven Law, Mediation And Arbitration Association, Uşak Hukukçular Derneği, Aksaray Baran Hukukçular Derneği, Aydin Hukukçular Derneği, Ankara Hukuk & Hayat Derneği, Hukuk Adamlari Birliği Derneği (Jurists Union Association), Hukuk Etik Siyaset Araştirmalari Derneği, Antalya Kural Hukukçular Birliği Derneği, Gaziantep Müdafaa Demokrasi & Hukuk Derneği, Adalet Okulu Derneği (Justice Academy Association), Mezopotamya Hukukçular Derneği, Özgürlükçü Hukukçular Derneği ,Kocaeli Cihan Hukukçular Derneği, Balikesir Hukukçular Derneği, İstanbul Nizam Hukukçular Derneği, Elazig Hukuk & Hayat Derneği, Eskisehir Hukuksal Bakiş Derneği, Istanbul Denge Hukuk & Düşünce Derneği, Mersin Ahenk Hukuk Derneği, Mizan Hukuk Derneği, Adana Nizam Hukukçular Derneği, Hatay Denge Hukuk Derneği, Boğaziçi Hukukçular Derneği, Isparta Hukuçular Derneği, Van Burç Hukuk Derneği.